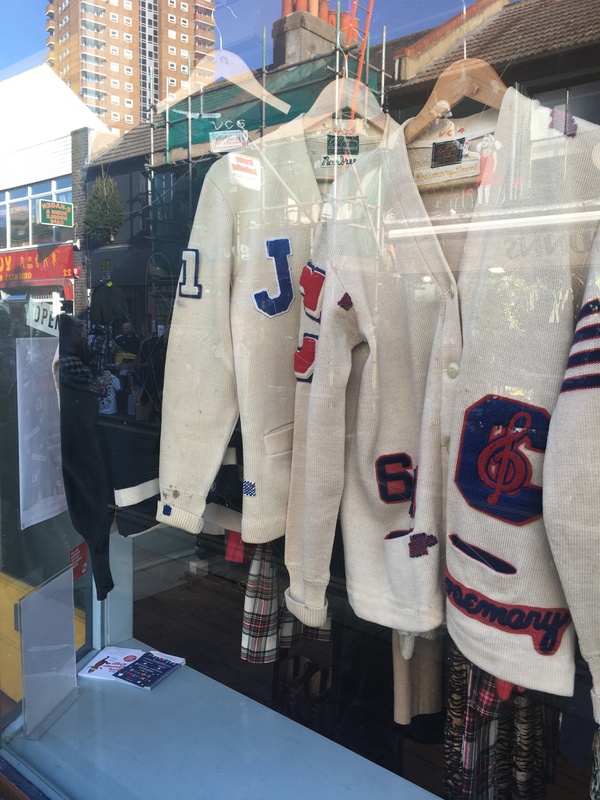 An exclusive collaboration with Wolf & Gypsy, these one-off vintage varsity cardigans are available in store only, while stock lasts (available from November 2018.) 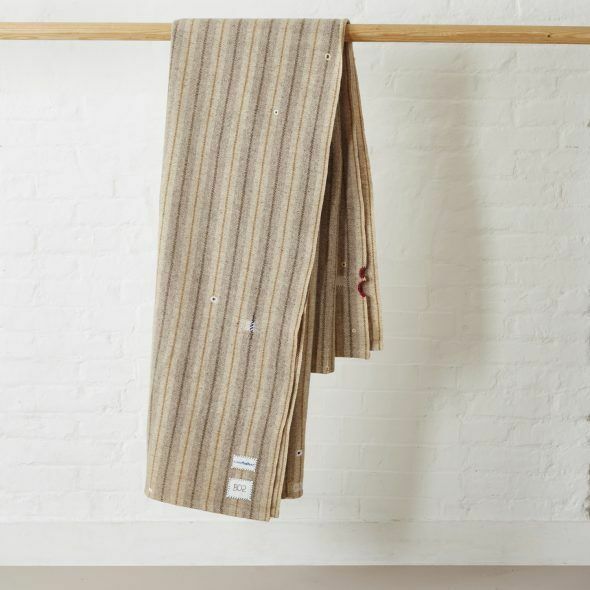 Each one is a different size and every cardigan has its own unique repairs. 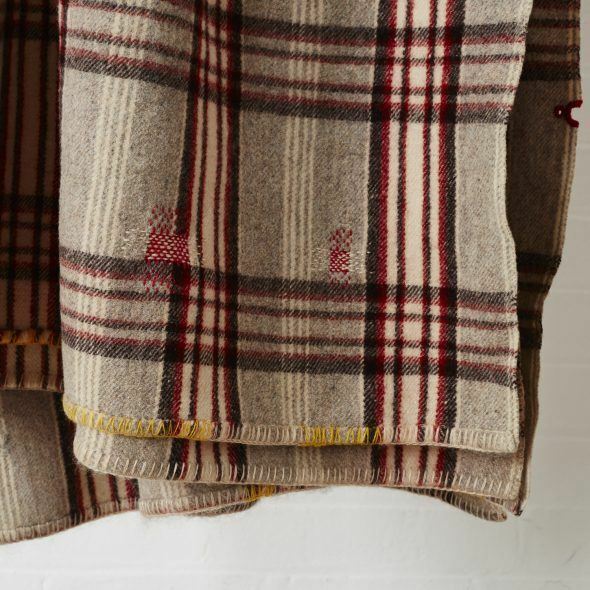 Vintage 20th century Welsh wool blankets by Tom of Holland repaired using Shetland wool with a variety of techniques. Channeling Tom’s style of visible mending, the intention of his work is to keep the history of the piece. Each repair is done depending on the unique signs of wear seen on the blanket, making it entirely unique. Included is a serial number, recorded in Tom of Holland’s Visible Mending Programme Log Book. Exclusively available at The New Craftsmen, London. Tom can repair your treasured heirloom blankets, please contact The New Craftsment for details. 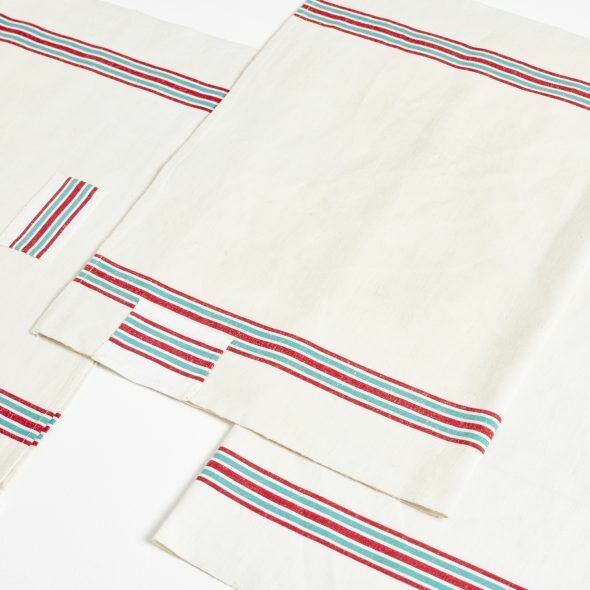 Exploring the disruption of the towel’s stripe pattern using traditional mending and repair techniques, this vintage linen tea towel has been patched with a hemmed patch – a domestic method used to repair household linens. 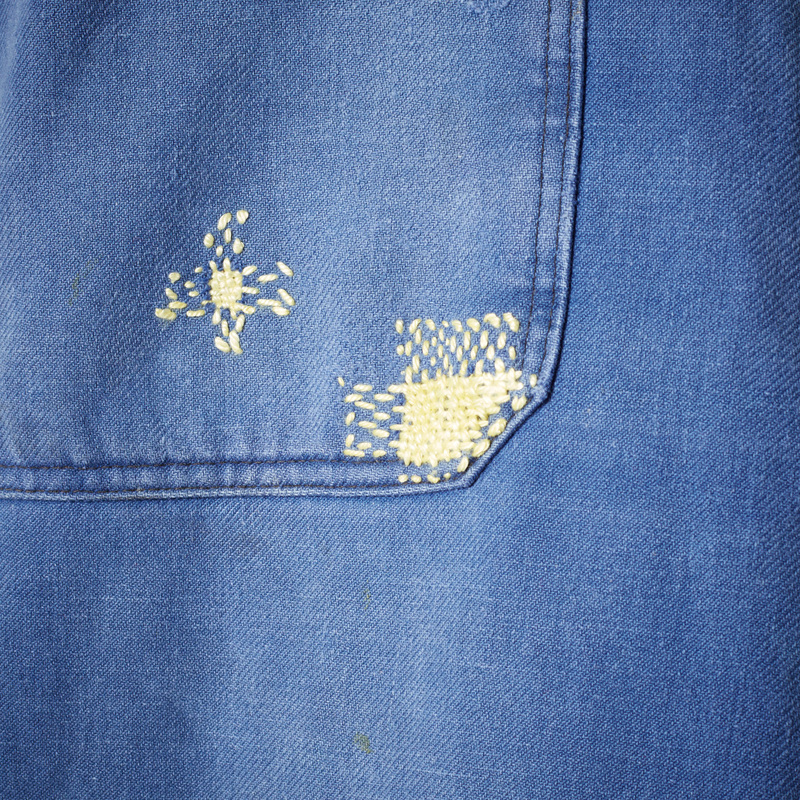 Channeling Tom’s style of visible mending, the intention of his work is to keep the history of the piece. Each repair is made depending on the unique signs of wear making it entirely unique. 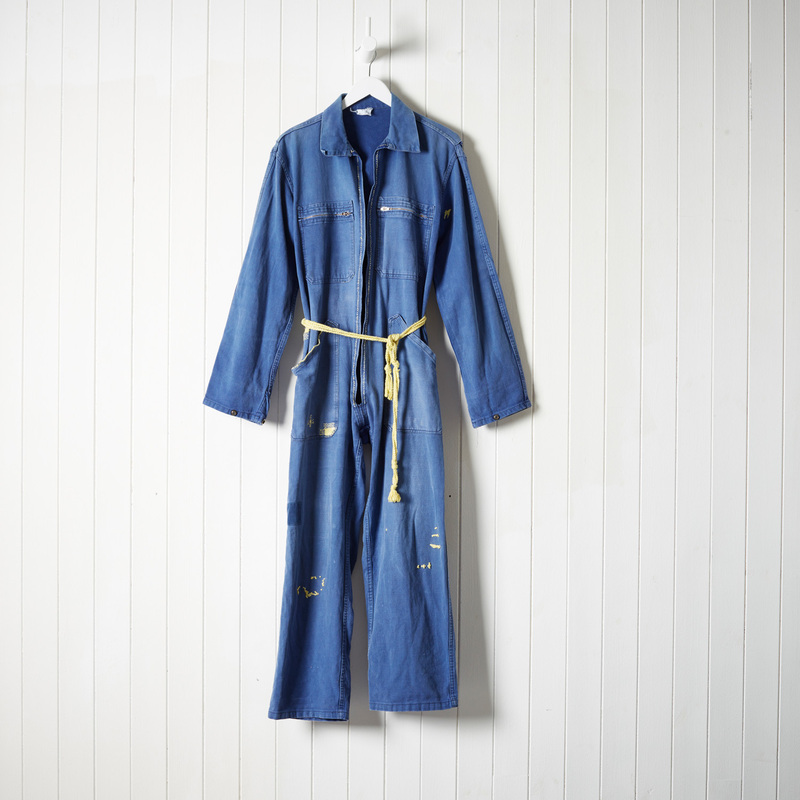 This boilersuit forms part of the Visible Mending Programme, and is recorded in Tom of Holland’s Visible Mending Programme Log Book; the serial number VMP10 is hand-stitched on the inside and comes with a description of materials and techniques used. 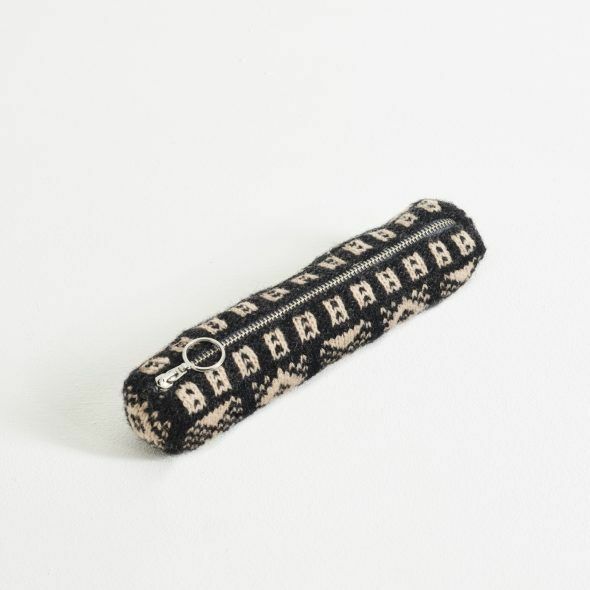 One-off wool pencil cases, hand-knitted in one piece from Shetland wool in a traditional Sanquhar pattern. The interiors are lined with vintage Italian silk with a small Paisley print. Sanquhar knitting is a distinctive form of Scottish knitting featuring two coloured patterns- developed in the late 1700s by the knitters in Sanquhar, near the Scottish Borders, to protect the local hand-knitting industry. Even though hand-knitting as a cottage industry died out during the 19th century, the tradition has continued. Each pencil case has a tag with the exact pattern name on it. Some pattern names indicate a subtle variation in stitch pattern. Further information on exact stitching can be found here.